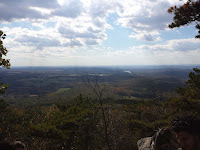 Normally after a nice climb up Sugarloaf Mountain we descend and head directly to one of the top wineries in Maryland, Sugarloaf Mountain Vineyard. 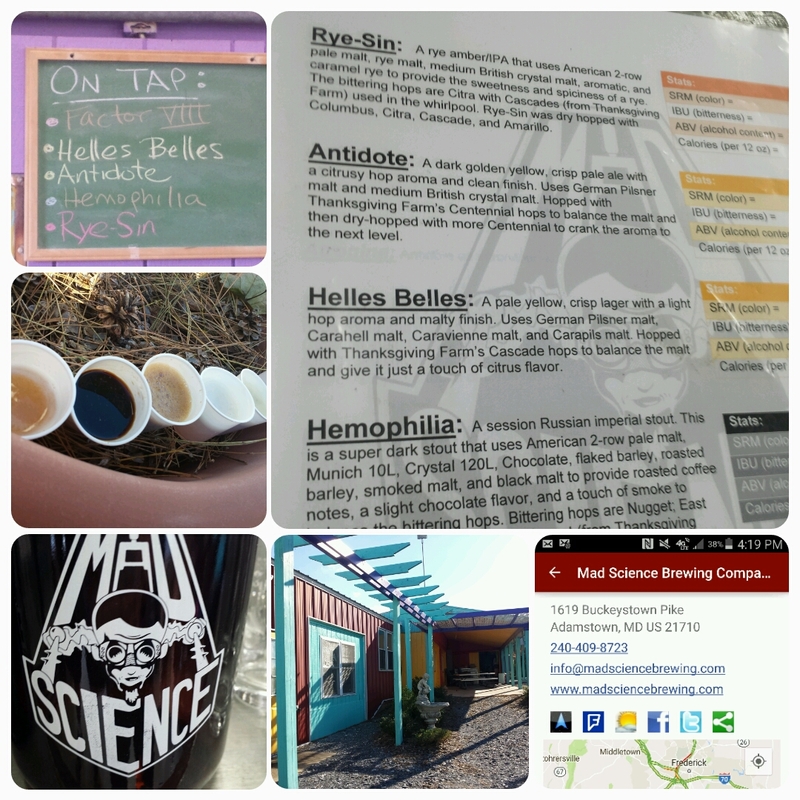 However, this past weekend we decided to investigate a nearby year-old brewery: Mad Science Brewing Company. 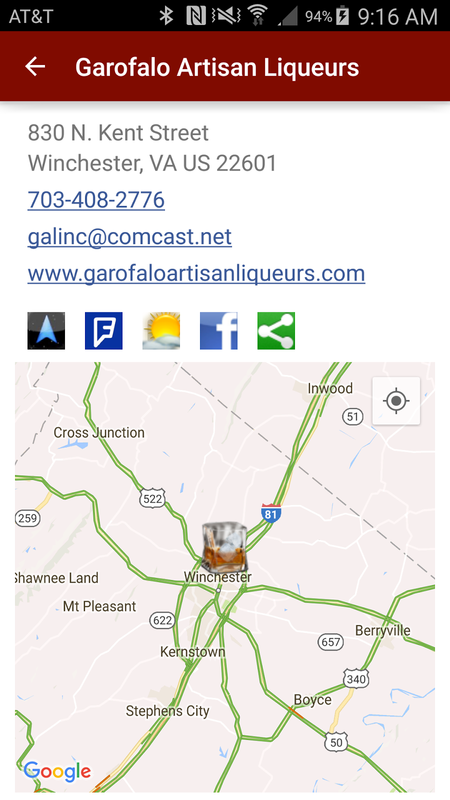 theCompass Winery, Brewery, Distillery Locator Mobile App showed us that the brewery is located north of the mountain on a route to Frederick. It is located in Thanksgiving Farm; grows Columbus/Zeus, Nugget, Centennial, Cascade, and Magnum hops; and is as nano as possible. On our visit there were four beers available: Helles Belles lager, Rye-Sin Amber IPA, Antidote Pale Ale, and Hemophilia, an Imperial Stout on draft and nitro. This was very tasty, even refreshing after the hike. More refreshing was the Helles Belles. This is a fantastic beer, light but flavorful with the right amount of minerality and hops. Well done. 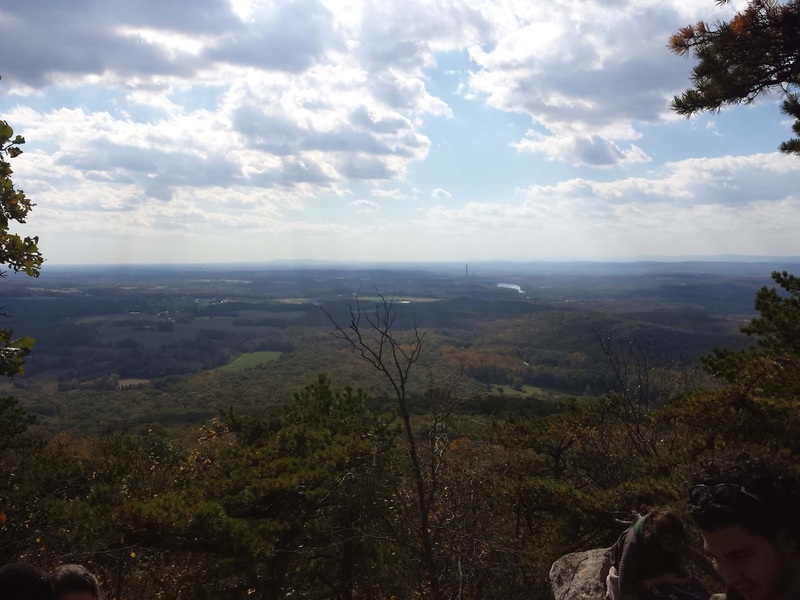 And a fellow hiker raved about the Antidote so there are good things coming out of this nano brewery. 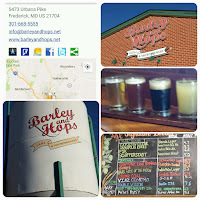 After a round, hunger set in so we headed into Frederick to the long running restaurant-brewpub Barley & Hops. 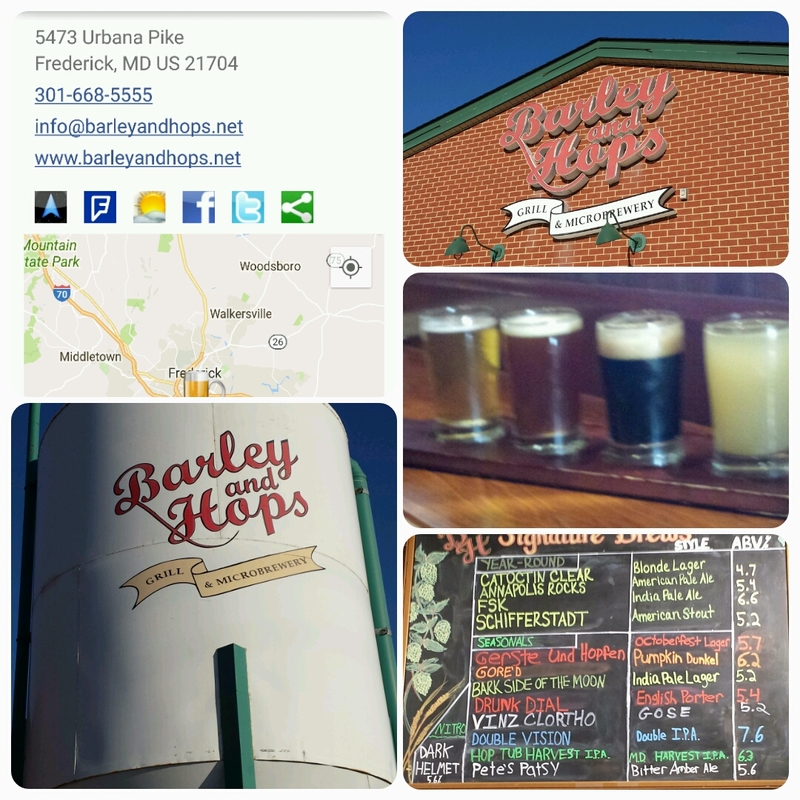 In fact, the brewery has been operating since 1999 producing a wide range of beer styles. Over bratwurst I chose a sampler of the Catoctin Clear Blonde Lager, Vinz Clortho Gose, Gore'd Pumpkin Duppel, and Drunk Dial Porter. The lager was very good, flavorful, just not the minerality and hop balance as the Mad Science version. The gose was very interesting, tart and smokey. The last two were my favorites with the pumpkin duppel showcasing the squash and ,alt as opposed to the dreaded holiday flavors. And the porter was spot on. Nicely done and a highly recommended spot to eat. Cheers. 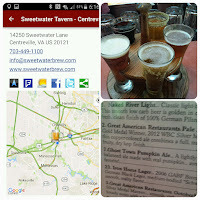 We've been off the #VABreweryChallenge for too long and stopped of at local brewpub chain Sweetwater Tavern Centreville for an early Sunday dinner. There are two other Sweetwater Taverns, one in Merrifield and the other in Sterling, with the trio sharing the same beer menus. The food is quite nice and reliable across all three with the beer decent, but not exceptional. The Naked River Light is a lightly hopped Pilsner suitable as a lawnmower beer. On the other hand their Iron Horse Lager has more flavor and hop profile and more satisfying on my palate. The Great American Restaurants Pale Ale was my favorite - a solid offering. The Great American Restaurants Oktoberfest was as expected with suitable maltiness - I just don't care for the style. And finally, their Ghost Town Pumpkin Ale is not bad, spices added to the glass rim not the brew. I like that serving method. Cheers. 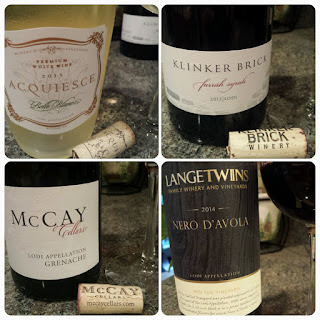 On the heals of a very successful 2016 Wine Bloggers Conference hosted by Lodi Winegrape Commission, Snooth continued the Lodi momentum by hosting a virtual tasting of four Lodi wines. For a recap, once synonymous with old vine Zinfandel, the Lodi AVA currently grows over 100 different grape varieties and was named Wine Enthusiast's 2015 "Wine Region of the Year". The region is located between the San Francisco Bay and the Sierra Nevada Mountains and is known for it's hot dry days and an evening breeze that commences on schedule every evening providing a noticeable diurnal shift in temperature. 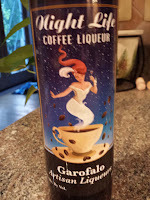 Perfect for retaining grape acidity. Lodi is home to approximately 65 wineries -- many multi-generational family operations. During the Snooth virtual tasting Master Sommelier/Snoother Tim Gaiser interviewed Stuart Spencer, Program Manager, Lodi Winegrape Commission & Owner/Winemaker, St. Amant Winery, and Michael McCay, Vineyard Manager and Owner/Winemaker, McCay Cellars to discuses the diversity of the region through these four wines. Acquiesce Winery & Vineyards 2015 Belle Blanc Lodi White Blend ($26) - (45% Grenache Blanc, 45% Roussanne, 10% Viognier). 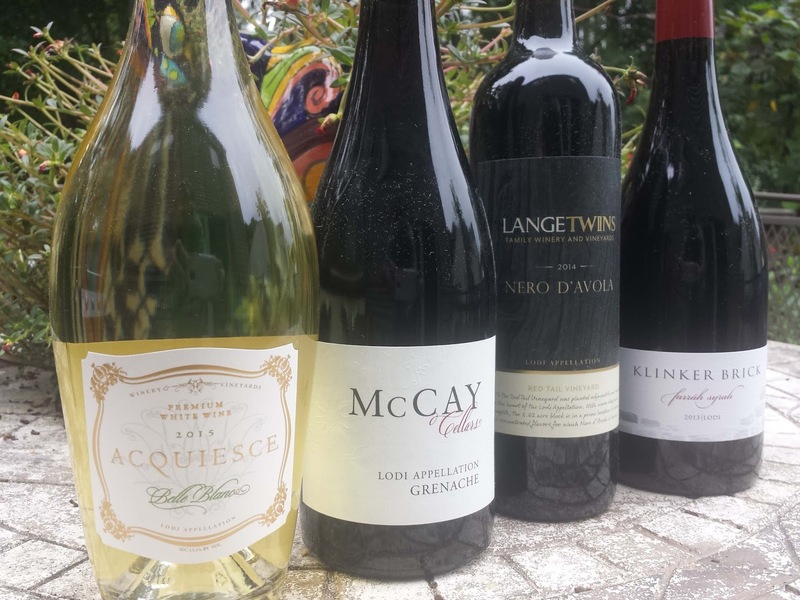 Acquiesce Winery is Lodi’s only dedicated white wine winery. This wine is made in the classic Châteauneuf-du-Pape Southern Rhône style from cuttings acquired through Tablas Creek Vineyard (originally from Château de Beaucastel Winery). The wine is simple floral, savory, stone fruit, light citrus, long fresh finish. Perhaps not that simple. 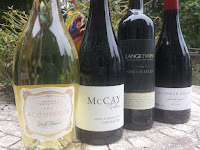 McCay Cellars 2013 Lodi Grenache ($35). I devoured this wine during the WBC16 winemaker dinner. 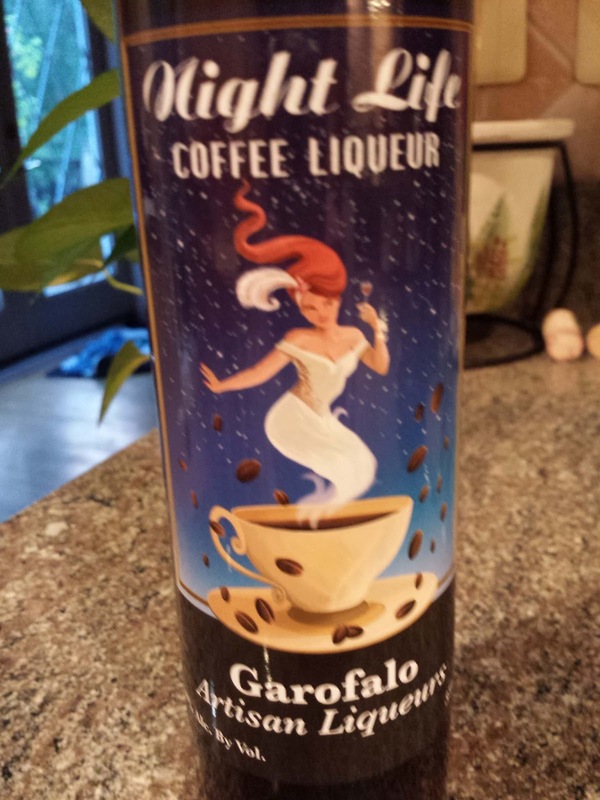 It is lighter bodied, with red cherry flavors and an herbal center; finishes with killer acid. A fantastic wine. LangeTwins Winery & Vineyards 2014 Lodi Nero d’Avola ($20). Another #WBC16 favorite from during the speed tasting, this 5th generation farm family shows more Lodi diversity by growing grapes normally found in Sicily. 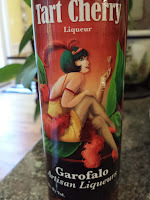 The wine is very bright and fresh with dark cherries, mint, and a very smooth finish. This is your afternoon table wine. Klinker Brick Winery 2013 Lodi Farrah Syrah ($20). This wine spent 15 months in French oak providing a chalky, spicy, and smoky character. The wine finishes with very structured tannins. Nicely done and at this price, quite the value.